CAE today announced that CAE USA, prime contractor for the United States Air Force (USAF) KC-135 Aircrew Training System (ATS) program, has received an Authorization to Operate (ATO) on the USAF's Distributed Training Center Network (DTCN). The first KC-135 operational flight trainer (OFT) to receive the ATO is located at Scott Air Force Base (AFB). Additional KC-135 ATS sites, including March Air Reserve Base (ARB), Fairchild AFB, Grissom ARB, and MacDill AFB, are expected to transition onto the DTCN in the 2017-2018 timeframe. Receiving the Authorization to Operate on the DTCN means that KC-135 aircrew training devices can be networked and connected to other Mobility Air Force (MAF) platforms so that the USAF can conduct live-virtual-constructive (LVC) training on a secure and classified network. The KC-135 Stratotanker provides the core aerial refuelling capability for the USAF and has served in this role for more than 50 years. This unique tanker platform enhances the Air Force's capability to accomplish its primary mission of global reach. The KC-135 aircrew training devices support this mission and help train more than 3,500 KC-135 aircrews annually. CAE USA is the prime contractor on the KC-135 ATS program and began efforts more than a year ago to connect the KC-135 simulator fleet to a virtual network where they can train with other aircrews in simulators representing various platforms to provide virtual air refuelling. Recently, CAE USA's cybersecurity team obtained a difficult, but critical certification requirement called the Authority to Operate, which allows the KC-135 simulator systems to operate on the DTCN. "Acquiring the Authority to Operate was a tough challenge and a significant engineering milestone," said Clifford Sanchez, U.S. Air Force KC-135 Aircrew Training System Manager. "We look forward to the fast-approaching capability to conduct virtual air refuelling across a network. The ability to conduct persistent and realistic virtual air refuelling training in a distributed mission operations environment enhances our training capability and helps us cost-effectively maintain proficiency and readiness." In order to achieve an ATO on the DTCN, CAE USA worked closely with the USAF to ensure the KC-135 OFT met the required U.S. Department of Defense risk management framework and cybersecurity standards. CAE USA and the USAF are now in the process of transitioning additional KC-135 aircrew training devices so that the USAF will have the ability to conduct more virtual training over the DTCN. "This is an important step in supporting the U.S. Air Force and their desire to increasingly leverage distributed, networked training capabilities to cost-effectively enhance mission training," said Ray Duquette, President and General Manager, CAE USA. "The upgrades we are making to the KC-135 aircrew training devices combined with rigorous risk management and cybersecurity implementation will help ensure the integrity and availability of having the KC-135 play a key role in live-virtual-constructive training exercises." CAE's Defense & Security business unit focuses on helping prepare our customers to develop and maintain the highest levels of mission readiness. 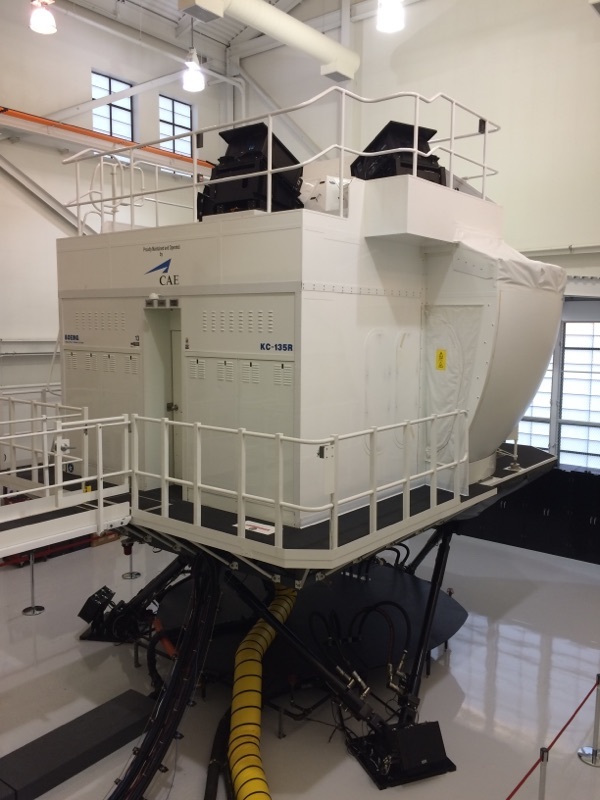 We are a world-class training systems integrator offering a comprehensive portfolio of training centres, training services and simulation products across the air, land, naval and public safety market segments. We serve our global defense and security customers through regional operations in Canada; the United States/Latin America; Europe/ Africa; and Asia/Pacific/Middle East, all of which leverage the full breadth of CAE's capabilities, technologies and solutions.